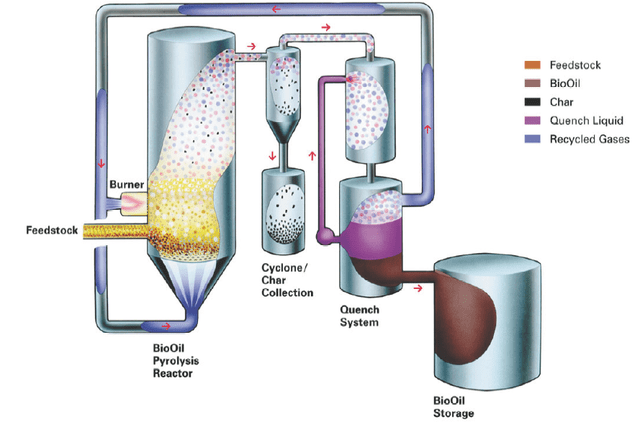 Biomass pyrolysis transforms organic material such as agricultural residues and wood chips into three main components: syngas, bio-oil and biochar (which contain about 60 per cent of the carbon contained in the biomass. 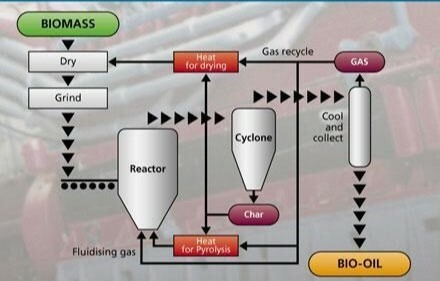 Biomass pyrolysis process can be used to sequester the carbon and remove circulating carbon dioxide from the atmosphere and stores it in virtually permanent soil carbon pools, making it a carbon-negative process. Biochar sequestration is considered carbon negative as it results in a net decrease in atmospheric carbon dioxide over centuries or millennia time scales. Biochar sequestration could make a big difference in the fossil fuel emissions worldwide and act as a major player in the global carbon market with its robust, clean and simple production technology. The use of pyrolysis also provides an opportunity for the processing of agricultural residues, wood wastes and municipal solid waste into useful clean energy. Although some organic matter is necessary for agricultural soil to maintain its productivity, much of the agricultural waste can be turned directly into biochar, bio-oil, and syngas. The two main methods for biochar production (sometimes also referred to as charcoal) are fast pyrolysis and slow pyrolysis. The biochar yield is more than 50% in slow pyrolysis but it takes hours to complete. On the other hand, fast pyrolysis yields 20% biochar and takes seconds for complete pyrolysis. In addition, fast pyrolysis gives 60% bio-oil and 20% syngas. Bio-oil is a dark brown liquid and has a similar composition to biomass. It is composed of a complex mixture of oxygenated hydrocarbons with an Bio-oil has a much higher density than woody materials (three to six times, depending on form), which reduces storage and transport costs. Bio-oil is not suitable for direct use in standard internal combustion engines. Alternatively, the oil can be upgraded to either a special engine fuel or through gasification processes to a syngas and then bio-diesel. Bio-oil is particularly attractive for co-firing because it can be more readily handled and burned than solid fuel and is cheaper to transport and store. Since the oil has a density of about 1200 kg m-3, it can be conveniently transported over long distances. Current end-use possibilities are as a boiler fuel for stand-alone heat or in combined heat and power (CHP) using the steam cycle after either diesel or gas turbine electricity generation. The majority of these options have been found to be technically feasible. In addition, bio-oil is also a vital source for a wide range of organic compounds and speciality chemicals. What are some of the companies exploiting the comercial potential of Biochar, Torrefaction and Pyrolysis? Thanks for your kind words. Shall be happy to discuss areas of mutual interests and collaboration.